Thinking of Buying and Investment Property? Buying an investment property is a huge step in growing financially. For one, you have the chance to earn passive income. For another, it’s an opportunity to diversify your assets. That said, it’s also a huge responsibility, both personally and financially. If you’re going to take this step, you want to make sure that you’re well-prepared for what’s to come. So, if you’re thinking about buying an investment property, you’ve come to the right place. We’ve created a handy guide, filled with everything you need to know about purchasing – and maintaining – one of these properties. The first step in buying an investment property is determining what type of property you would ultimately like to purchase. Keep in mind that each one will have its own level of maintenance needs and financial commitments for you to consider. Condos: Most commonly found in urban or resort areas, condos are a great choice for those looking for a smaller, simpler investment property. With condos, you own the interior of your unit, but all common spaces and amenities are taken care of by an association. There will be a maintenance fee to cover these costs. Townhomes: Townhomes are houses, rather than units. However, similar to condos, the exterior of the home and any common spaces are governed by an association. In this case, there will also be a maintenance fee for communal upkeep and there may be rules governing what you cannot do to the home. Duplexes/Triplexes: Duplexes and triplexes are privately owned buildings that are split up into multiple units. Here, you can have multiple tenants with no recurring fee. However, you will also be responsible for any upkeep. Single-Family Homes: Single-family homes are your traditional housing set-up. Again, you’re responsible for any upkeep. This type of rental property is usually well-suited for those looking to rent to families or longer-term tenants. Ultimately, most of what you’re looking for in a property will depend on the type of renter that you’ll eventually attract, as each one has its own set of needs and priorities. Vacationers: Vacation rentals have higher turnaround, with renters usually staying only for days or weeks at a time. But, when done right, they can also capture high returns. Vacationers want to be as close as possible to the main attraction, so focus on location above all else. 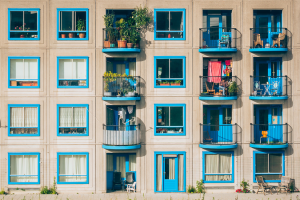 Smaller units like condos often work well with this type of renter, especially when they boast amenities that are geared toward convenience. Short-term renters: Short-term renters will rent from you for a few months before moving on. For example, these renters might be students or younger professionals recently relocating. Typically, short-term renters prefer homes that are close to amenities like shops and restaurants or public transportation. These renters also tend to prefer furnished properties. Long-term renters: Long-term renters are ideal for landlords who value a steady rent check each month over the ability to charge the highest per-night rates. Typically, these renters may be families or settled professionals, and they tend to prefer a more residential lifestyle. Single-family home or townhomes are a good fit and the quality of the school district tends to be a bigger consideration than proximity to downtown. Of course, no matter who you’re after, there are some considerations that are universal. For instance, the amount of work that your new property requires before you can rent it out. For that, you’ll need to find a balance between the amount of money you’re willing to spend versus how much sweat equity you can put in. Often, it’s worth spending a bit more upfront to get a turnkey home, or one that only needs cosmetic updates, than risking finding costly problems later on in a fixer-upper. Financing a rental property is a bit different than one that will be your primary residence, so you’ll want to take the time to make sure you’re prepared for the expense before you hit the market. First up, in order to secure a mortgage on the property, you should be prepared to make a much larger downpayment. We’re talking the 20% – 25% downpayments of yesteryear. Plus, your credit history needs to be in great shape. Since there aren’t any government back programs like FHA for second mortgages, you’ll need to have at least a credit score of 620. Then, there are taxes to consider. Unfortunately, the new Trump tax plan makes it much harder for investors to write-off some of the costs of juggling multiple properties. The new plan cut the available mortgage interest deduction in half — capping the total amount of deductions at $500,000. It also severely limits the amount of state and local property taxes that an owner can write-off. Now, the limit is $10,000 total, between all of your properties. Finally, there are also upkeep and maintenance costs to consider. If you’re buying a condo or townhome, you’ll likely have a monthly association fee to contend with on top of your mortgage payment. There’s also the cost of any updates that need to be made to the home. And, as the landlord, necessary maintenance is solely your responsibility. When you buy an investment property, there are two scenarios that you can run into regarding tenants. If there are existing tenants: Leases “run with the land” — meaning they do not change if the property is sold. If there are existing tenants in the home you’re purchasing, you are legally obligated to keep the terms of their lease before it expires. So, no kicking them out or raising the rent. Some landlords like this because it means a guaranteed income, but others prefer to have more control over who they rent to. In some areas, there are more stringent rent control laws in place to protect tenants. Be sure to read up on your local rent control laws to make sure you get a realistic idea of how much you could profit. If there aren’t existing tenants: Buying a home without any tenants in it is more of a gamble financially because it could sit empty for a few months while you search for the right fit. Make sure your prepared to carry the mortgage for a bit. However, you’ll also have the chance to choose your own renter and to do any financial or background checks that you see fit before handing over the keys.